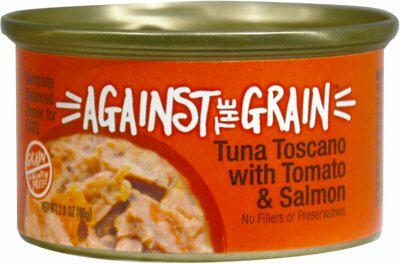 Your furry feline is a unique individual with his own personality, and he deserves to eat a one-of-a-kind meal like Against the Grain Tuna Toscano with Tomato & Salmon Dinner Grain-Free Wet Cat Food. Featuring sustainably caught, hand-packed wild bonito tuna as the very first ingredient, as well as savory salmon and delicious tomatoes, this special food is totally different! 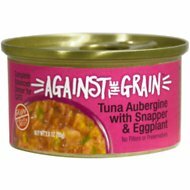 It’s fortified with vitamins, minerals and nutrients to provide complete and balanced nutrition, and it’s also grain-free and gluten-free, so it’s easy on his digestion and ideal for the cat with allergies or food sensitivities. Healthy, garden-fresh tomatoes are rich in vitamins A, C and E, bioflavonoids and antioxidants; also helps balance pH to limit crystals. Sustainably caught, hand-packed wild bonito tuna is the very first ingredient in this delectable food that also includes savory salmon and delicious tomatoes. Bonita Tuna, Water Sufficient For Processing, Tapioca, Sunflower Oil, Salmon, Tomato, Tricalcium Phosphate, Salt, Guar Gum, Vitamins (Vitamin E Supplement, Niacin, Vitamin A Supplement, Pyridoxine Hydrochloride, D-Calcium Pantothenate, Riboflavin Supplement, Biotin), Minerals (Zinc Oxide, Reduced Iron, Sodium Selenite, Manganese Sulfate Monohydrate, Copper Glycine Complex, Potassium Iodide), Choline Chloride, Magnesium Sulfate, Taurine. An average cat weighing 9 lbs will consume 3 cans daily. Adjust as needed for your cat's age & activity. Refrigerate unused portion up to 36 hours. Provide plenty of fresh water. Even people do not always have it this good. My cats cannot get enough of this stuff. I micromave it to their preferred temperature and they literally scarf the stuff up. It comes in a plastic container also which is sometimes in stock and sometimes not. Don't even think about it. Just buy it. I’m completely amazed at how in love all 4 of my cats are with this variety of this food!! I didn’t hold high hopes based on it having tomato in it but as reviews said they absolutely love it!! Their heads don’t come out of the dish at all and they keep at it till they get every morsel and look at me for the next helping!! They also love the Tuna Mango Tango except 1 kitty wont eat that one. But these are the top 2 favs!!!! This was a hit at our sanctuary. I was worried that it wouldn't be because I've never heard of cats enjoying tomatoes. When we put this down, they clean their bowels. I cannot name another food that gets that response and we've pretty much tried them all. The ingredient list is simple, without silly fillers and sustainably sourced. Basically everything we look for in a cat food. Highly recommend! My kitties are spoiled rotten and so I am always looking for new flavors of healthy food to tempt them. This food was well received by the majority. My cats really liked this. They ate it up. At first they were like, hmmm, what is this. Then they chowed down. So glad chewy's now has this brand. I have 5 cats and all love this flavor. It has just the right amount of "gravy" combined with nice meaty pieces. My three cats love these tiny cans of Tuna Toscano.